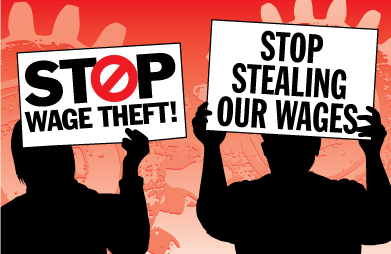 Two figures hold signs against wage theft. In a historic win, the union has negotiated direct compensation to members who were most affected by the pay fiasco over the summer. Approximately 350 members from Units 1 and 3 who were not made whole by June 10th, 2015, will receive a payment of approximately $80 paid as a non-taxed RA on the December pay cycle. The union grieved the employer this summer because of a total underpayment of $654,000 affecting almost 1000 members. As an initial remedy the University paid $25,000 to the Ways and Means Fund to compensate those members who faced immediate hardship because of the underpayment and committed to make members whole by June 10th. This was the case for approximately 2/3rd of the affected members; the remainder had to wait until August 25th to receive what they were owed. The direct payment we have successfully negotiated is interest calculated on the wages that were withheld. In addition, the University is making a $10,000 payment of damages to the union for the local to allocate at its discretion. The total compensation package totals $65,000, or 10% of the wages withheld, which we hope will be a significant deterrent for the employer to “ballpark” our wages in the future.